It appears that everyone got played, from the Canadian media to the Liberal Party and Jody Wilson-Raybould. The SNC Lavalin affair took out some of the biggest players in the Canadian government, including the prime minister’s principal advisor, clerk of the privy council, and the attorney general. It’s a stark reminder the election is on, even before the writ drops. I will now perform the post mortem analysis, armed with new details that were hidden from testimony to the justice committee. 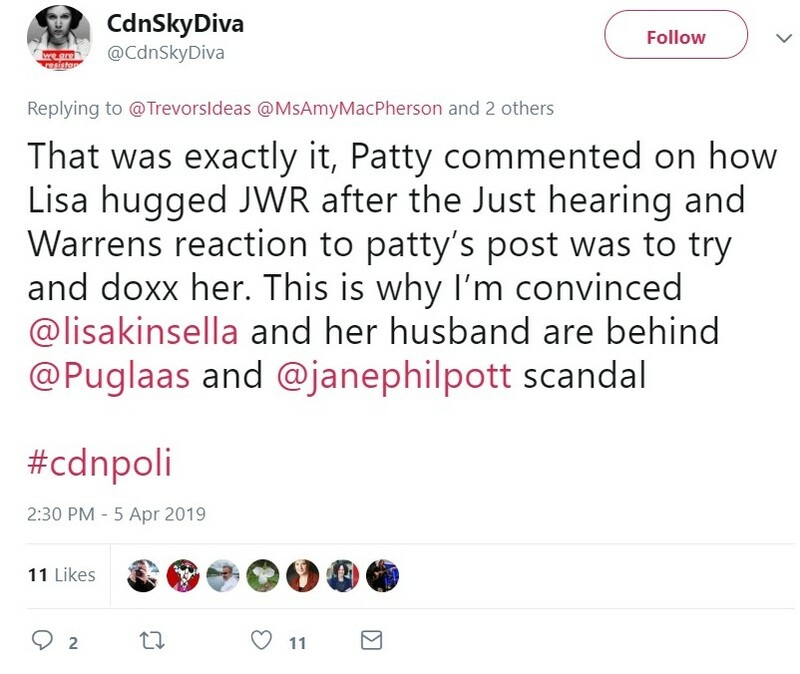 The reality is this scandal had less to do with SNC Lavalin than it did with Jody Wilson-Raybould’s indigenous heritage. A campaign was afoot against the former attorney general by various partisan interests to undermine her reputation and hamstring Liberals from making legal progress on the Indigenous Rights Framework promise. The only question is – was Jody Wilson-Raybould a completely unwitting target, or did she willingly participate at any point, against the interests of her party? Hopefully this assessment will provide her with a safer space to explain certain actions than the viciously skewed battle-ring constructed by Canada’s hyper-partisan media. Please note that sources will be linked for your inspection, including archived copies of the same pages (where possible) in case originals are deleted from the internet. This begins with a helpful timeline that puts agendas in greater perspective, followed by sections examining key players, the relevant conflicts between them, and the potential legal consequences for Canadian press freedom. 2014 – Multiple charges are laid against SNC Lavalin executives, related to the Libyan bribery scandal. This is arguably insubordination, for refusing to provide legal advice to the PMO. The request didn’t constitute pressure to offer a DPA; instead asking what happens when one is denied. 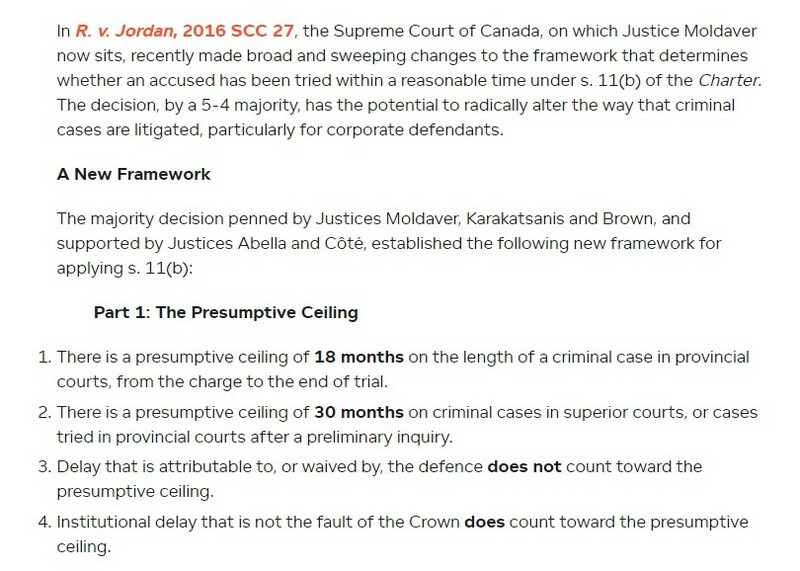 The legislation enabling a deferred prosecution agreement had only been live for one month when the prosecutor denied this option to SNC Lavalin. 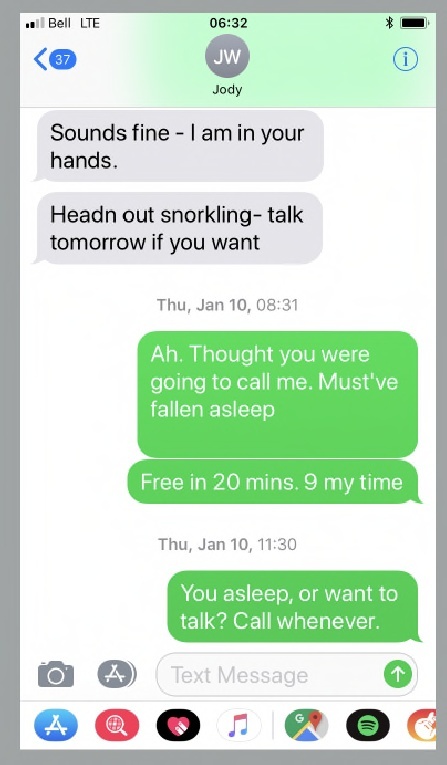 Also denied was advice to seek outside legal guidance on using a DPA, by the attorney general. One point of contention is the leaker cited confidential information within the Prime Minister’s Office that only staff in the PMO or PCO would be privy to. February 12, 2019 – Jody Wilson-Raybould resigns as Minister of Veterans Affairs. 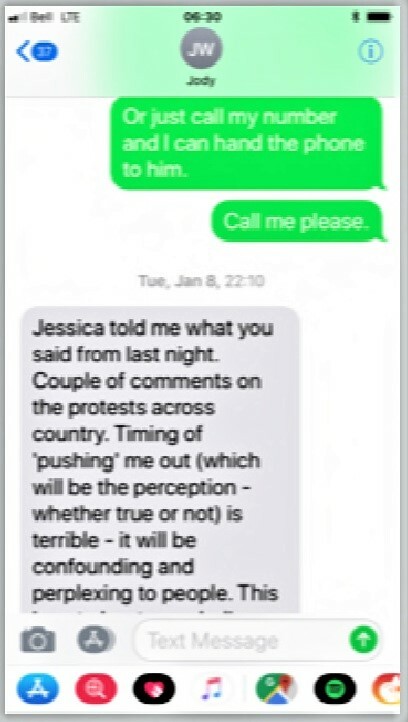 A number of anonymous sources leaked to media that senior government officials, including the prime minister, tried to negotiate with Wilson-Raybould for weeks leading up to this moment. They say the former attorney general had a number of conditions, such as apologizing and firing Gerry Butts, as well as Michael Wernick – but obviously that mediation was unsuccessful. 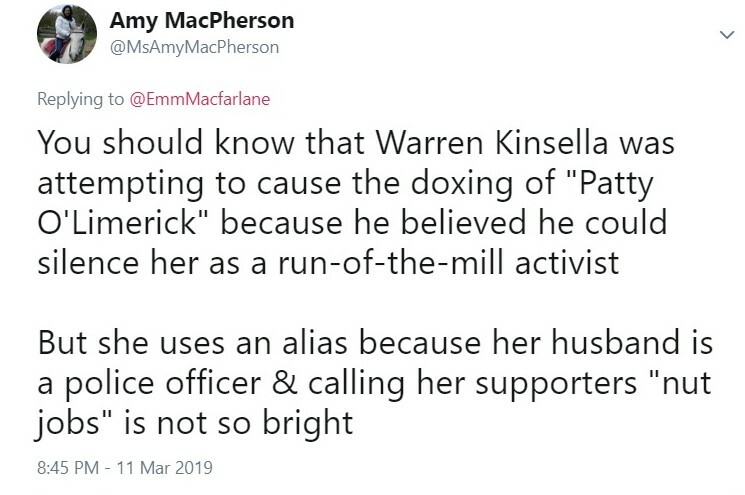 Kinsella responded by trying to obtain her personal information in a threatening way and the internet considered this a threat to dox her. 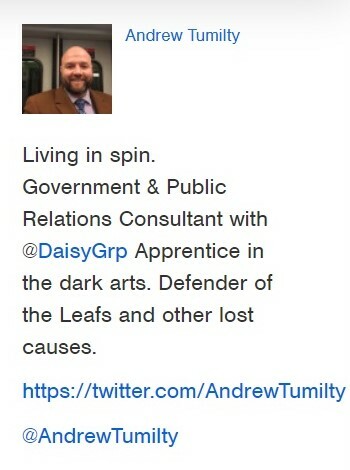 It is unknown if doxxing is considered conduct unbecoming of a lawyer by any law society. 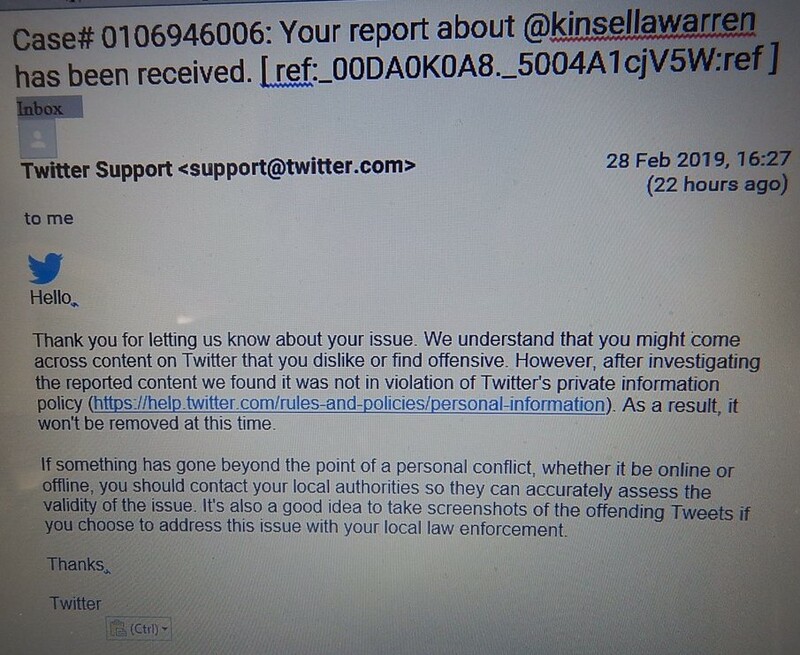 I’m not aware of a professional complaint being filed, although additional considerations about Mr. Kinsella are addressed in a subsequent section. 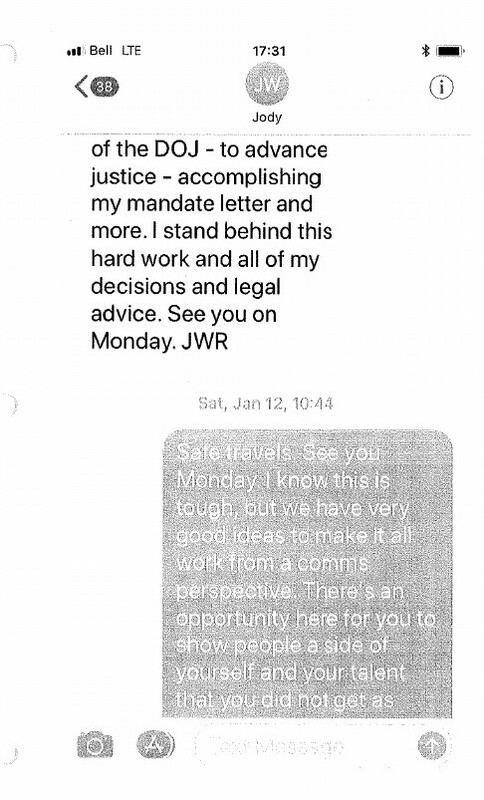 March 25, 2019 – An anonymous source leaks that Jody Wilson-Raybould recommended Justice Glenn Joyal for Chief Justice of the Supreme Court of Canada. 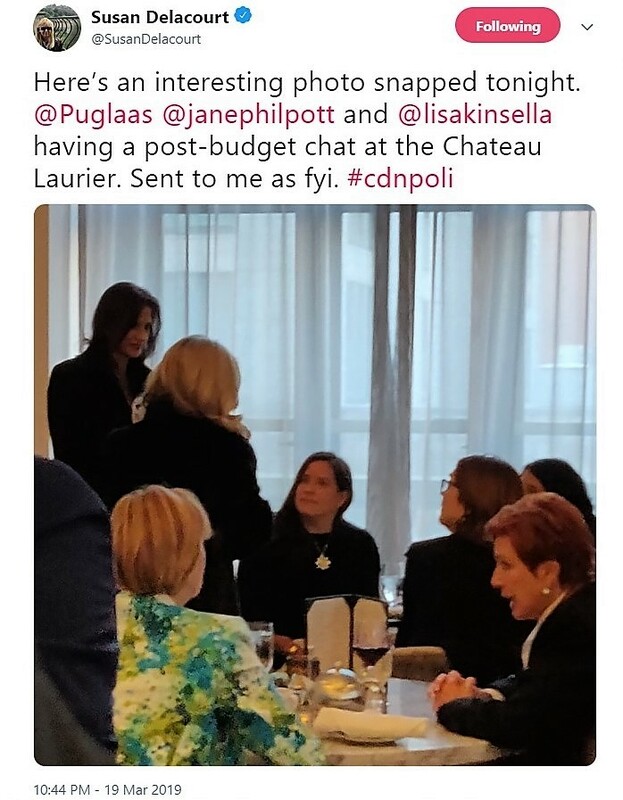 This information is highly confidential and she is criticized for backing a known Conservative, who took issue with Charter rights being used as a means of political activism to ‘govern from the bench’. 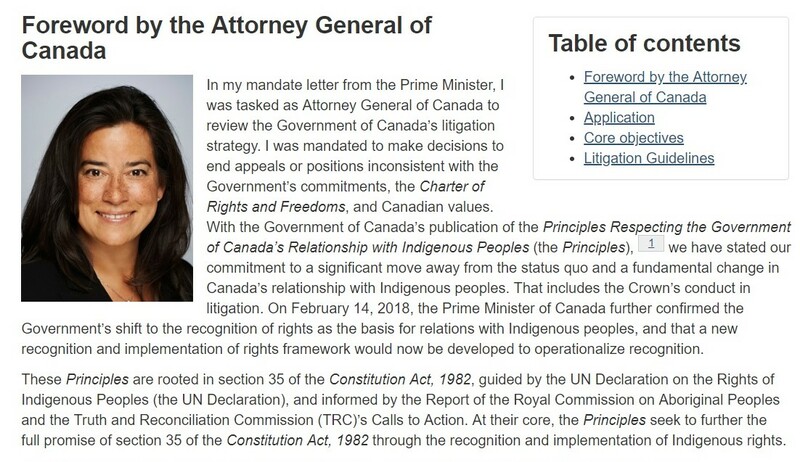 If you skipped it before, it would be prudent to read Jody Wilson-Raybould’s Attorney General of Canada’s Directive on Civil Litigation Involving Indigenous Peoples now. 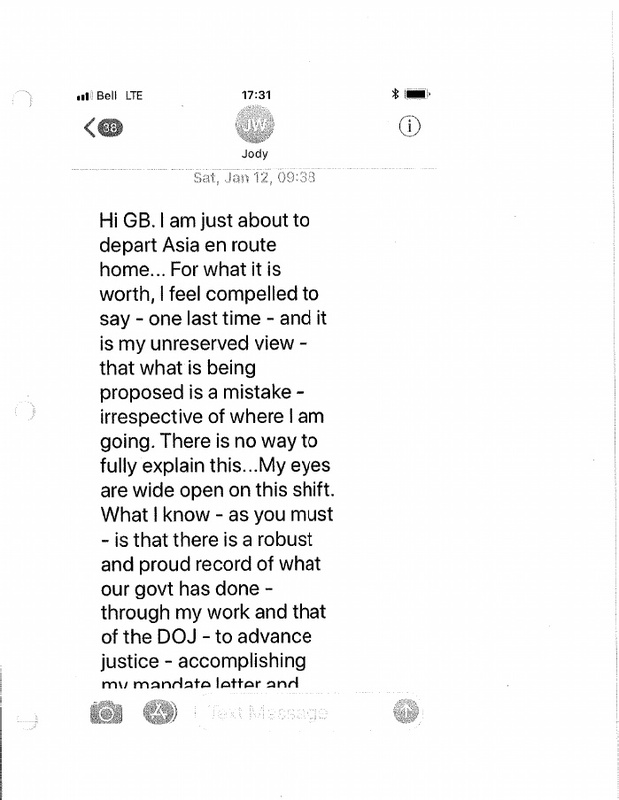 (original + archive) It was the most important work she did at the Department of Justice and the most controversial to Conservative opponents, as well as Michael Wernick (PCO) and nail-biters in the PMO. A full reading indicates she did not preclude government appeals against Indigenous claims, as the retired Conservative judge exclaimed. In fact, she walked an incredibly careful path to fulfill her mandate from the prime minister without hamstringing government lawyers from addressing Section 35 matters and civil litigation. Jody Wilson-Raybould did what she was instructed to accomplish. 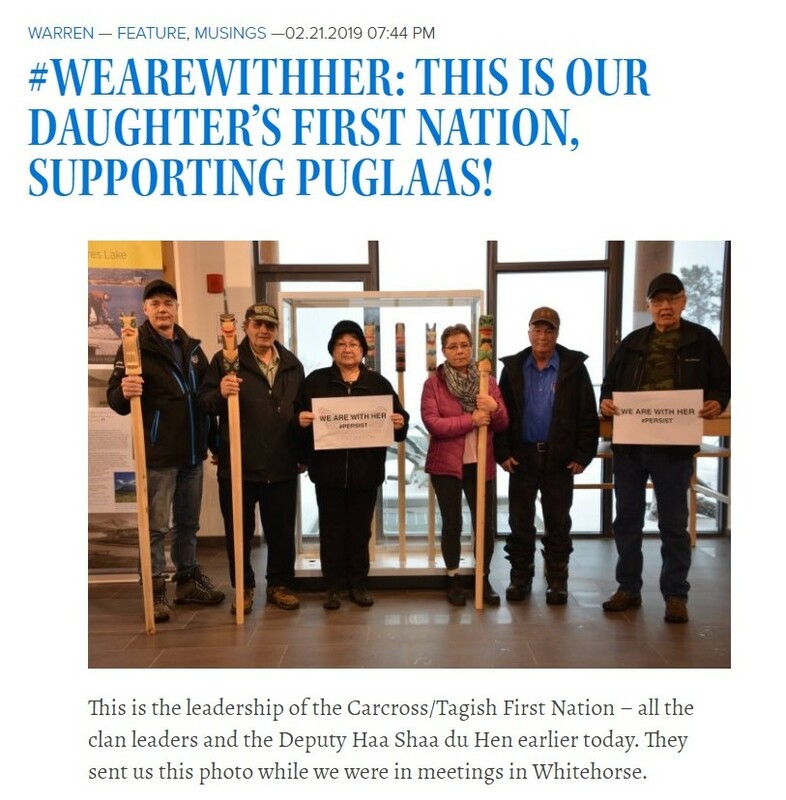 This despite opposition from Minister of Crown-Indigenous Relations Carolyn Bennett, and misogynist whisper campaigns that she was “difficult”. Cindy Blackstock is only one example and she was tormented for filing a human rights claim as executive director of the First Nation Child and Family Caring Society. The Assembly of First Nations supported Blackstock and she eventually won in a ruling that blasted the federal government for discriminating against Indigenous children by underfunding child welfare agencies on reserves. In Wernick’s testimony to the justice committee, he acknowledged a policy stand-off between Minister of Crown-Indigenous Relations Carolyn Bennett and Minister of Justice/Attorney General Jody Wilson-Raybould. But Wernick never describes the policy they disagreed about and the only one it wouldn’t be is SNC Lavalin. 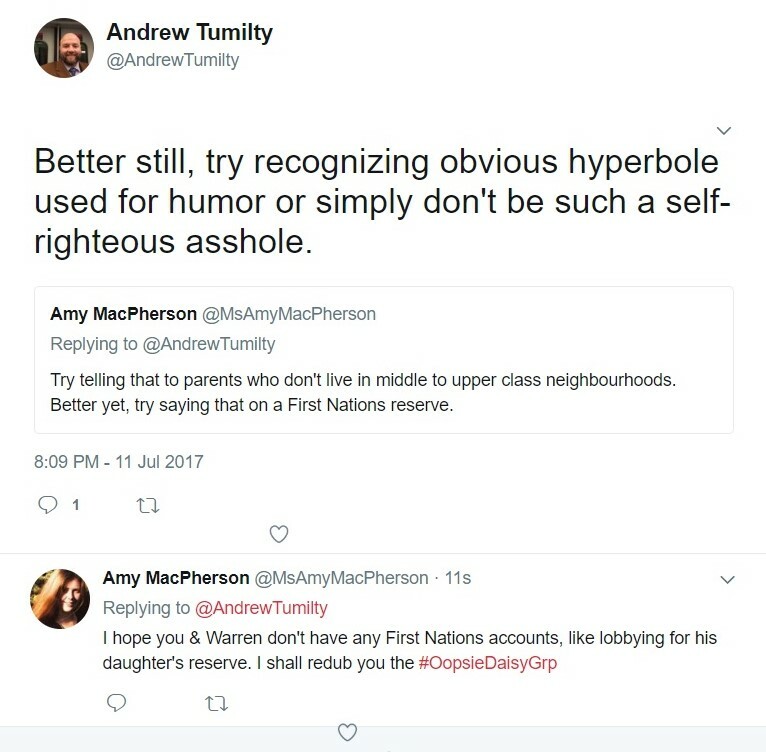 Dr. Philpott was the Minister of Indigenous Services and had to work with Dr. Bennett on the most regular basis out of all the cabinet ministers. Their jobs were related to serve the Indigenous population and both these women are physicians. But Dr. Philpott took a principled stand and supported Jody Wilson-Raybould, as an Indigenous attorney general, over Dr. Bennett and every other person in Cabinet. Philpott repeatedly warns there is more to this story and she compels Cabinet to be honest with the Canadian people. She accuses the prime minister and his closest advisors of ‘shutting down the story’, but never reveals what part of the story she feels is being silenced. 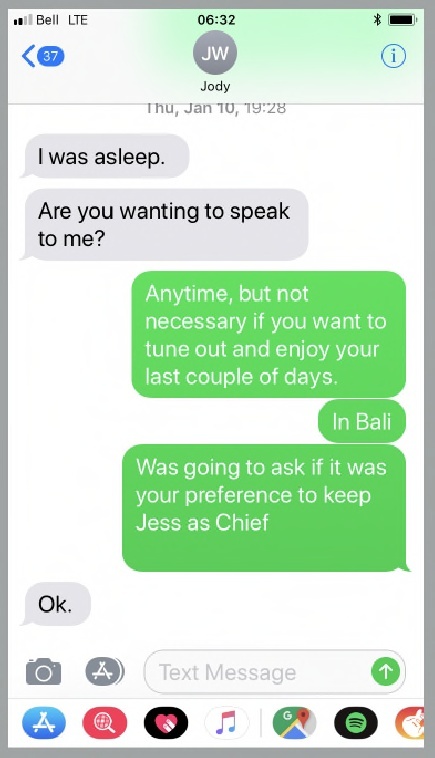 Likewise, Jody Wilson-Raybould won’t disclose two of her conditions for staying with the party, before her unceremonious ejection occurred. The high-ranking government leakers who peddled that story to multiple news agencies won’t discuss those two conditions either. 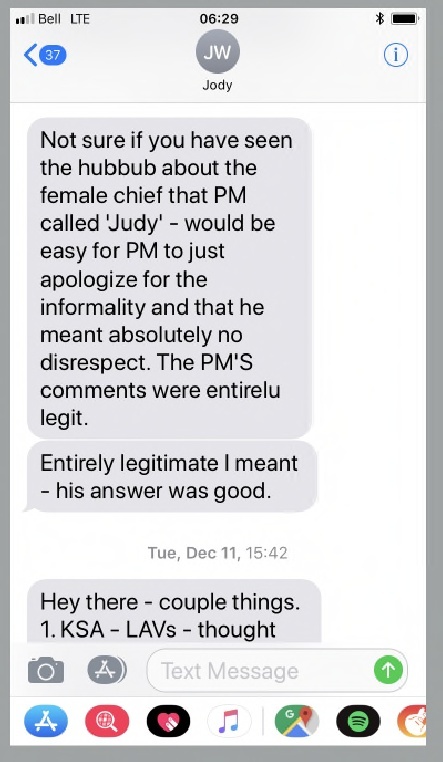 Despite Gerry Butts tabling his text messages with Jody Wilson-Raybould, her Attorney General of Canada’s Directive on Civil Litigation Involving Indigenous Peoples is the one thing that can’t be mentioned – even though it was part of their recurring discussions and part of the justice committee evidence. But key Conservatives are squawking about it and Micheal Wernick tried to make this directive an election issue. In some circles it’s been suggested that Jody Wilson-Raybould owed a deferred prosecution agreement to SNC Lavalin, to equalize the favoured treatment she’s been accused of giving to First Nations. 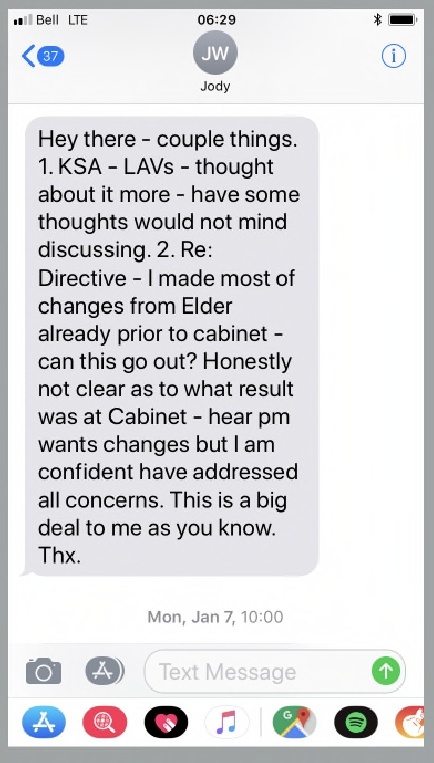 In a text conversation with the prime minister’s principal advisor, Wilson-Raybould further discusses the approval she needed from Conservative lawyers within the Department of Justice. The DOJ is supposed to be non-partisan, yet two of the highest-ranking officials in the country acknowledged needing that partisan buy-in to be able to proceed with the Indigenous directive. No one is questioning the tyranny of an attorney general needing to pacify the Opposition within the public service. 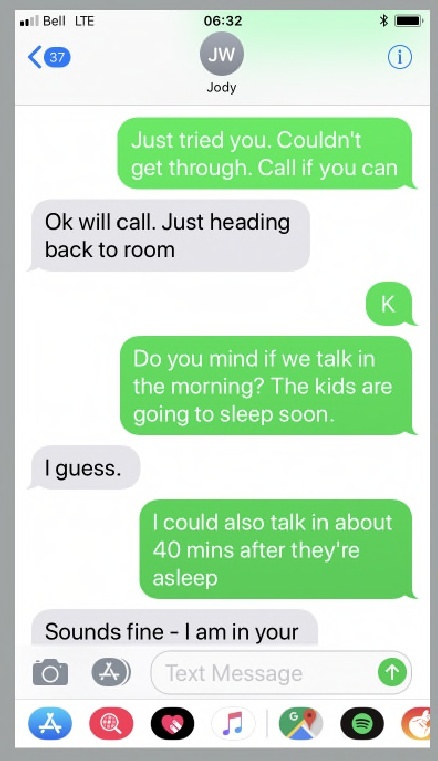 Jody Wilson-Raybould may have committed an ethical breach when she recorded Michael Wernick without informing him. It appears she may have been insubordinate when she instructed her deputy minister to withhold the legal opinion on SNC Lavalin from the Privy Council. This requires discipline. If we were to view this situation through a tort law lens, it could be compared to a drunk driving accident. The drunk driver causes the accident, but the victim with injuries wasn’t wearing a seatbelt. In cases like these the victim is still entitled to damages, but they lose 25 percent of the settlement due to their part in the negligence for failing to wear a seatbelt. In Canadian law our judgment doesn’t have to be all-or-nothing. It’s apparent there were extenuating circumstances for Jody Wilson-Raybould and a multi-faceted political campaign to deeply undermine her. 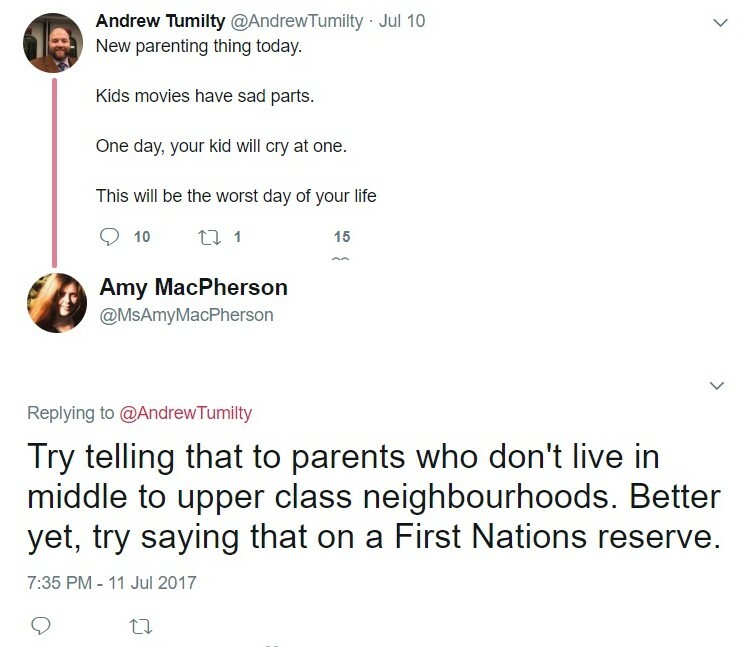 It doesn’t seem even-handed to throw the baby out with the bathwater, and Canada’s relationship with Indigenous peoples along with it. The former attorney general’s Indigenous directive is at stake and this is a decisive moment in Canadian history. Whether Cabinet and mainstream media want to discuss this or not, the repercussions of excluding Wilson-Raybould for writing that directive will reverberate for decades. This also comes after the Conservative experiment with attempting to manipulate Senator Patrick Brazeau. Dr. Philpott and Ms. Wilson-Raybould were willing to sit as back benchers and still contribute the wealth of their experience to representing constituents. Extraordinary investments were made in their professional development and it’s being wasted so a timid government can keep secrets about Indigenous issues as we head into an election. 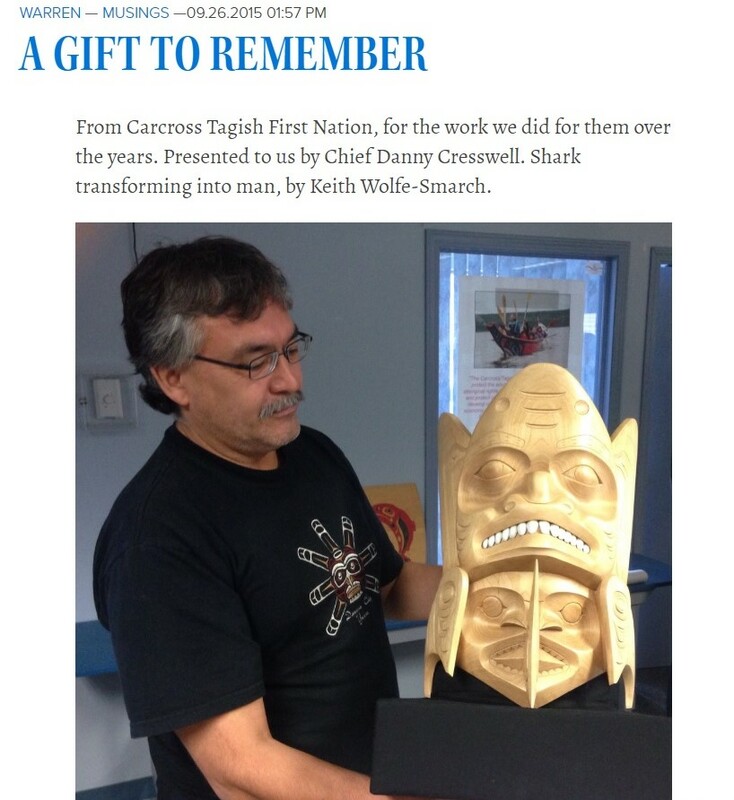 The Conservatives and NDP must not have wanted to be pigeonholed on reconciliation either, because it was their duty to know this and they chose to ignore or remain silent. The truth of the matter with SNC Lavalin is that two executives were exonerated when everyone wasn’t looking. Lengthy court delays intervened to make this a non-issue; and the Jordan ruling may yet prevail to dismiss the case against the corporation. If SNC Lavalin is forced to trial, they could still plead political interference based on the government leakers and partisan media spectacle over the past two months, non-stop. 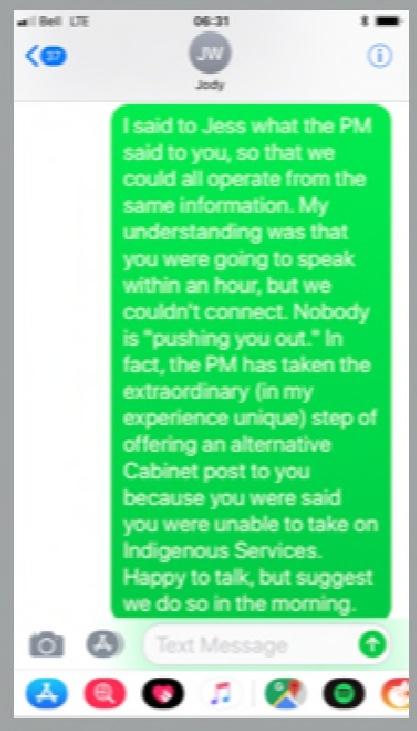 This isn’t a justifiable reason to discourage women in politics, or sever communication with Indigenous partners. 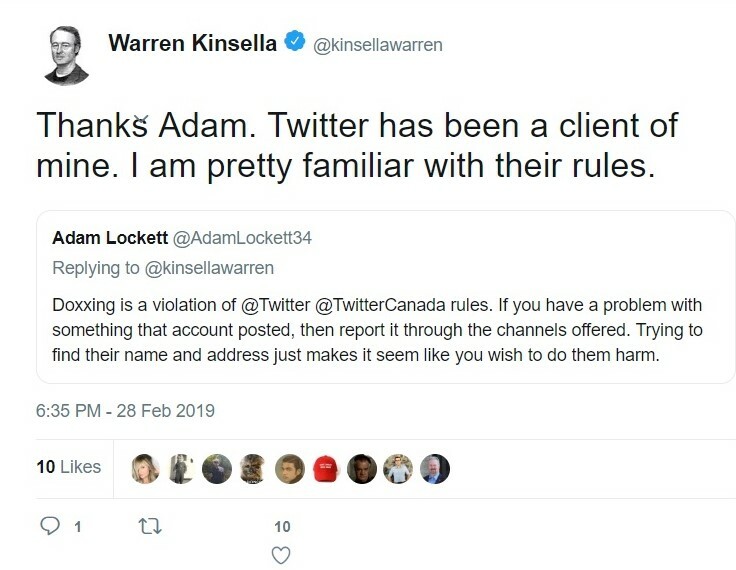 I’m well aware that Mr. Kinsella threatens lawsuits against his detractors liberally. We tangoed once before when his wife was an executive at ORNGE (the Ontario air ambulance) and that company was spectacularly scandalized. This section will begin by taking that elephant out of the room and thanking Kathleen Wynne for SLAPP legislation that was long overdue in Ontario. 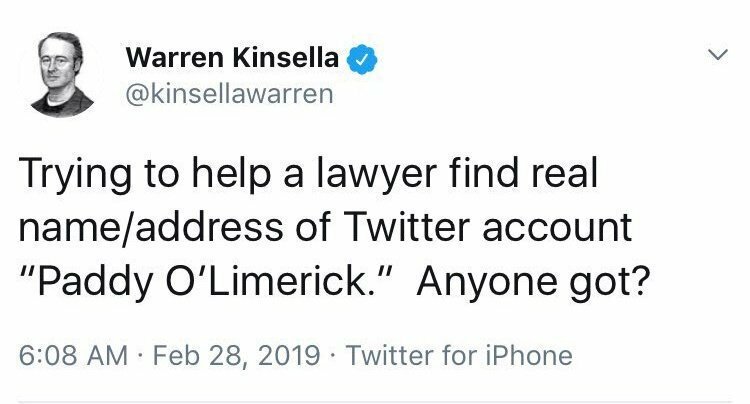 If Kinsella engages in silencing tactics anyway, perhaps the Ottawa bubble will pitch in for a Kickstarter campaign to fund a proper defence of press freedom. Preaching for Jody Wilson-Raybould to be allowed to speak her truth doesn’t mesh with censoring the analysts who know a thing or two about it. 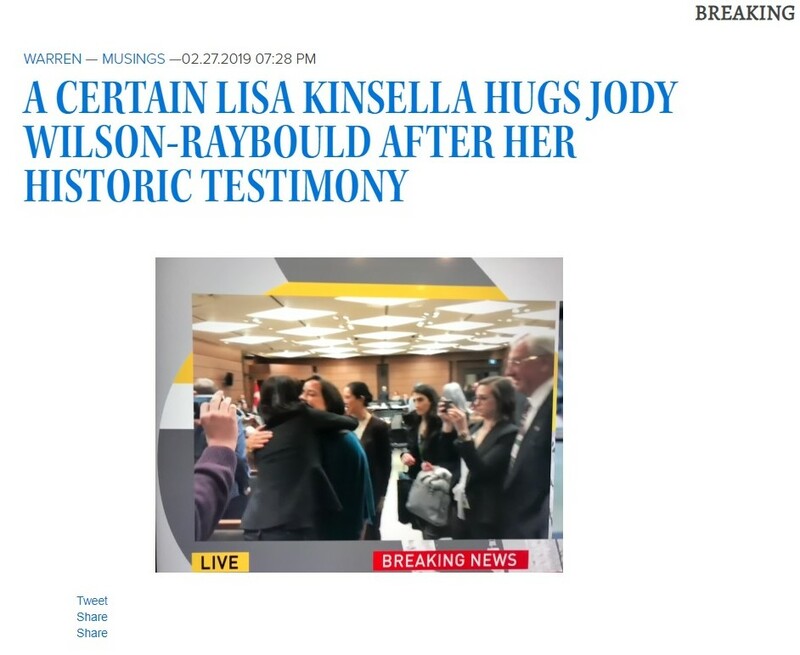 It’s become necessary to address the Kinsellas because they’re ingratiating themselves to Jody Wilson-Raybould and implanting their influence in the SNC Lavalin matter. 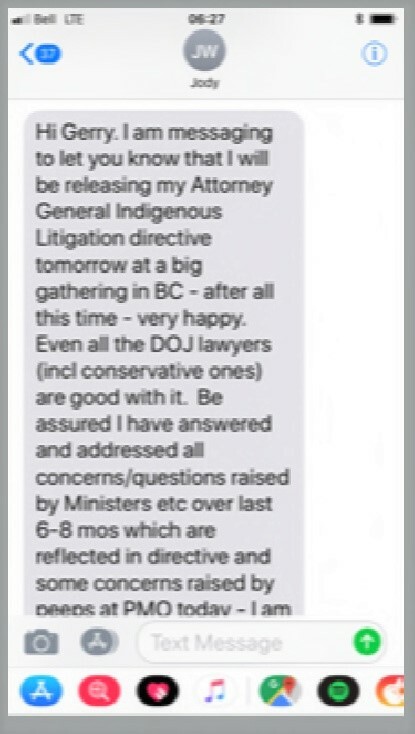 The former attorney general wouldn’t be familiar with the company she’s been keeping, or their conflict of interest with Indigenous issues that are being muffled by all the players. 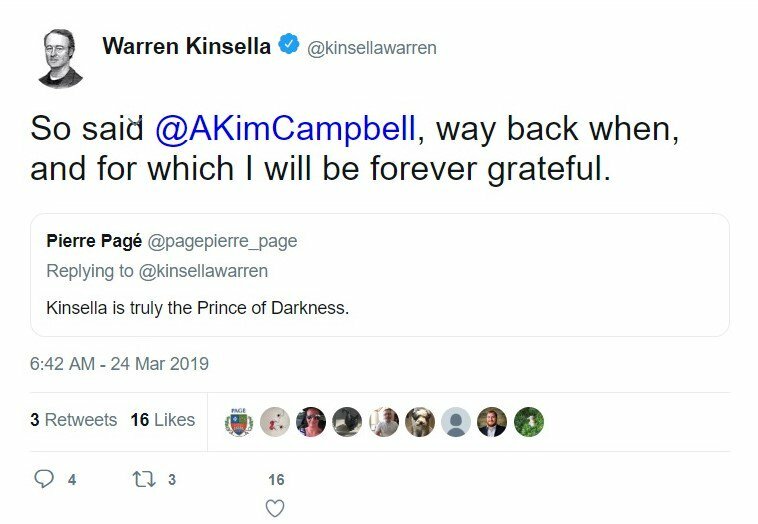 Warren Kinsella projects himself as a Liberal strategist, and indeed he was integral to the Ontario McGuinty government. (archive) He was also a staffer to Jean Chrétien, who was eventually undone by Paul Martin in a Liberal family coup. McGuinty was turfed as one of the most shady administrations and these rifts within the party have never quite healed. 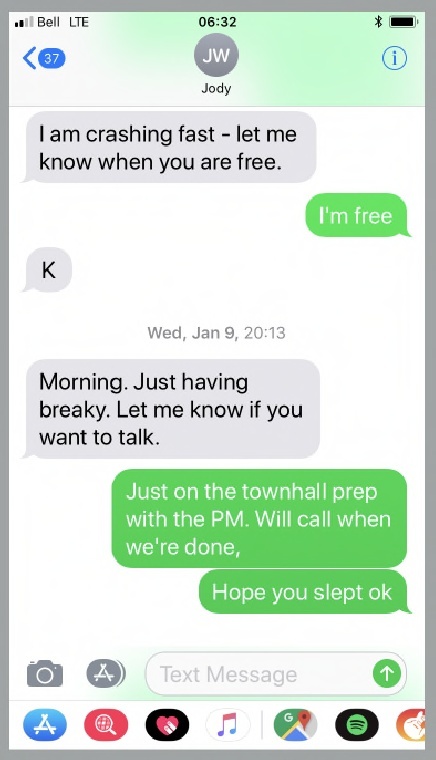 (archive) You can gauge that damage through the behaviour of Sheila Copps, lately on social media. 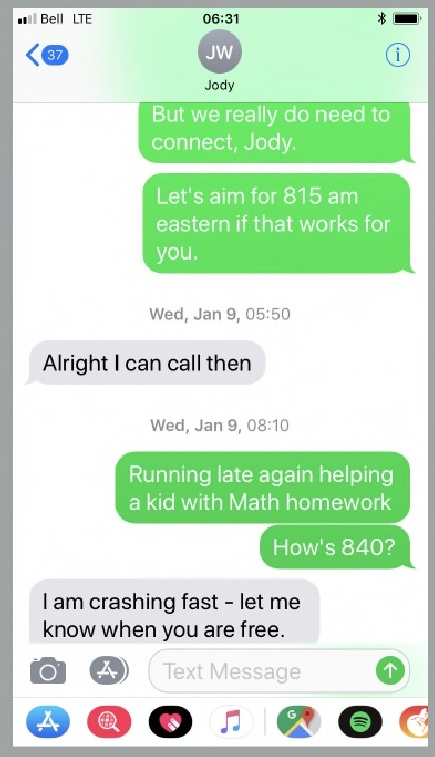 Gerry Butts is the best friend of current Prime Minister Justin Trudeau, but he was McGuinty’s principal secretary before assuming the same role with Trudeau. (archive) Both Kinsella and Butts were instrumental to the Liberal administration when the ORNGE bribery/kickback scheme was transpiring. Sun Media was owned by Québecor until 2015. (archive) And former Conservative Prime Minister Brian Mulroney remains Chairman of the Board at Québecor. (original + archive) Pierre Karl Péladeau is the CEO of Québecor and past CEO of Sun Media, as well as being the former Leader of the Parti Québécois. He’s best known for his political stance as a Québec separatist and ran for the PQ in a riding that is a stone’s throw from Justin Trudeau’s Liberal constituency. 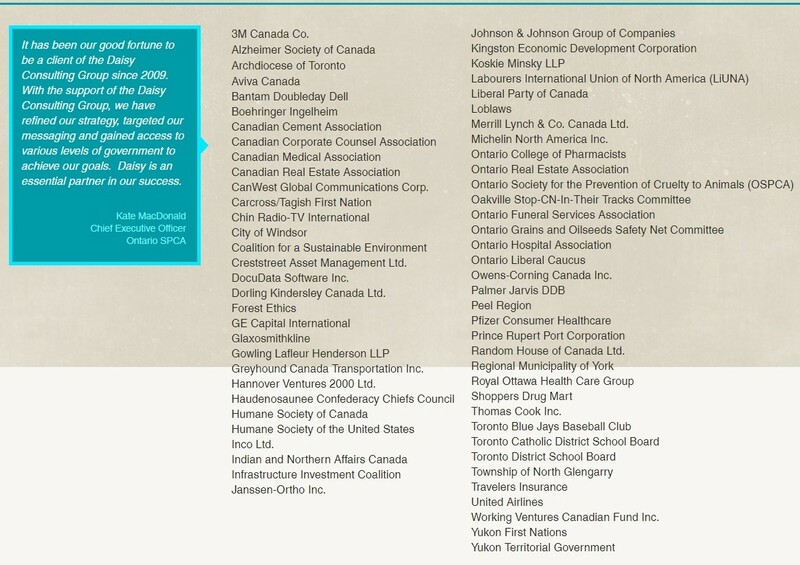 (archive) These are, or have been, the employers of Warren Kinsella. 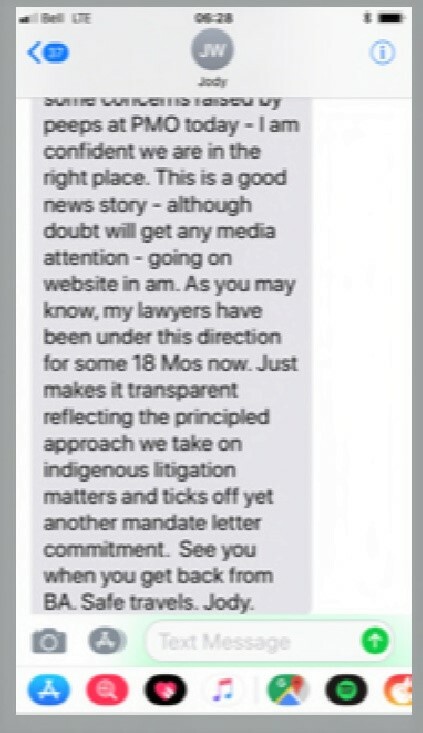 Kinsella has an interesting take on what constitutes a conflict of interest, but none could be more concerning than his precarious situation and attitude toward Indigenous matters. 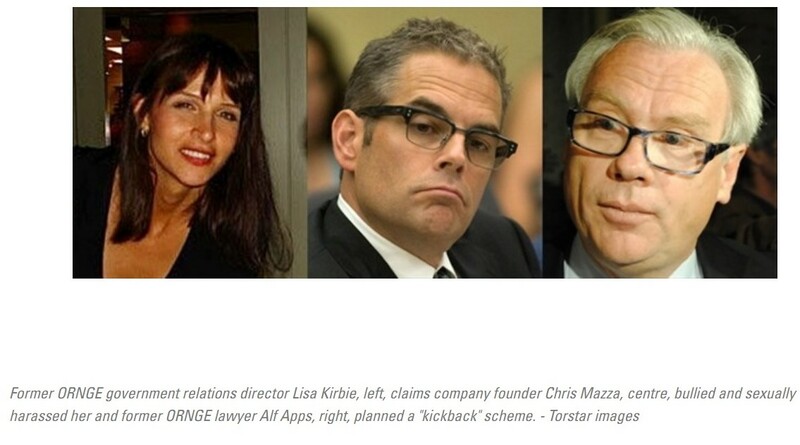 It should be noted that Lisa Kinsella joined the Daisy Group as a managing partner after leaving ORNGE. She’s originally from British Columbia, where Jody Wilson-Raybould calls home. 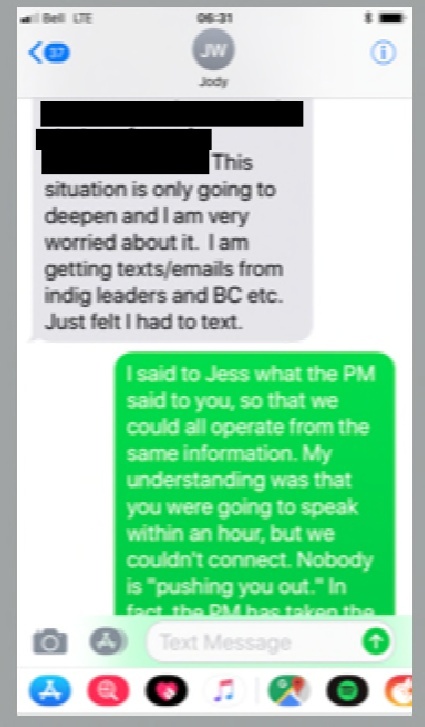 Only Jody Wilson-Raybould knows if the Kinsellas disclosed these details to her. Only she can tell us if she was aware that the attorney general’s Indigenous directive conflicts with the fee simple approach. Regardless of her knowledge though, SNC Lavalin has an interest in the way this plays out. A number of leaks have now occurred from the highest levels of the Canadian government. Whether it’s about the policy on deferred prosecution agreements, deliberations for a Supreme Court judge, the Khadr settlement (archive), or Jody Wilson-Raybould’s conditions to Cabinet, only the PMO, PCO, or Department of Justice could be responsible for them. 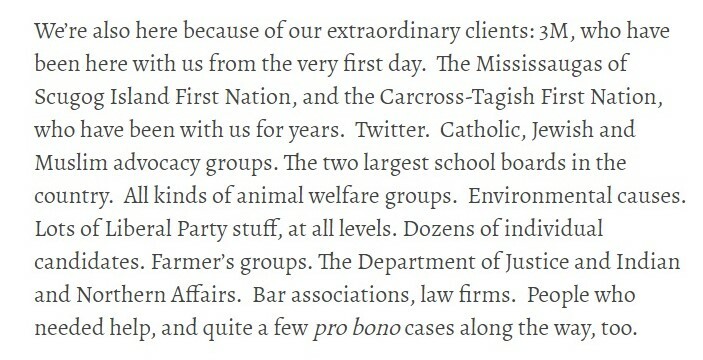 A campaign to remove the attorney general couldn’t be more clear and two of the people who aren’t behind this are Wilson-Raybould and Trudeau. But as a country we are nonetheless facing a severe security breach. It must be investigated to resolve the integrity of the federal government and the sanctity of operations – especially with an election approaching. That would mean trying to obtain records from journalists that are supposed to be protected, to determine the identity of leakers. It is with great regret that I bring this to everyone’s attention. The reason I’ve done this is to spark a genuine, adult conversation about the consequential issues that are going on behind the superficial headlines. 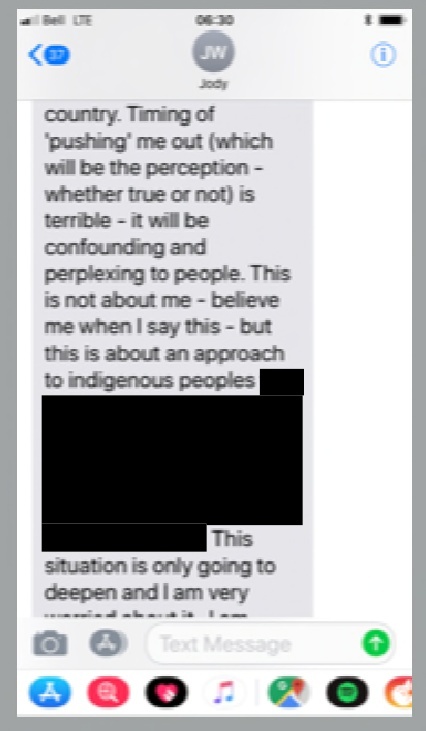 So long as we continue to believe the problem is over a DPA with SNC Lavalin, we will continue to fail at addressing these substantive threats to the Canadian – Indigenous relationship. Prime Minister Justin Trudeau and his lifelong friend, Gerald Butts, enjoy seeking sage advice in historical and contemporary literature. On that note this dispatch will close with a few words of that nature.